Web Portal Development Case Study StudentAffairs.com Julie Leos Kadian McIntosh Natalie Moses Joe-Ann Nguyen Florida International University. 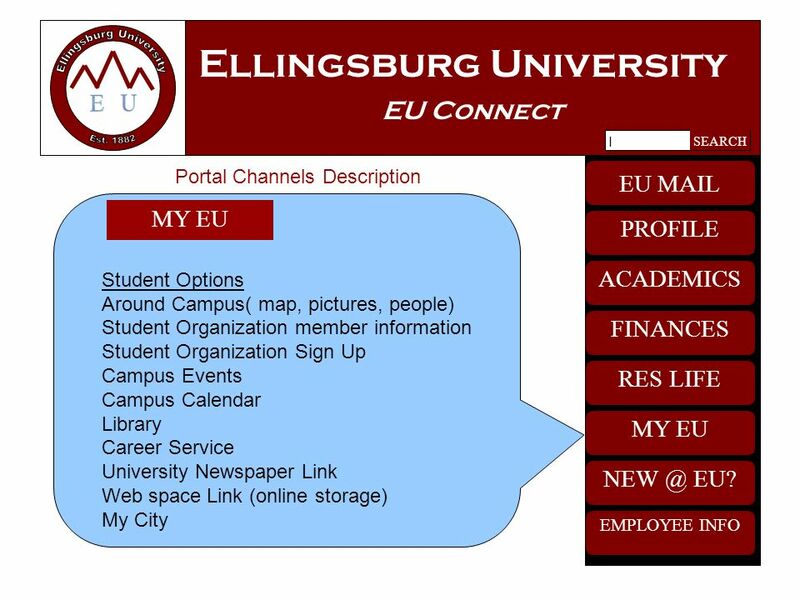 3 Ellingsburg University EU Connect Why customize a Web Portal? EU Connect is a customized portal that is an all encompassing tool for students. This will enable Ellingsburg University to increase the retention rates of students by increasing their level of satisfaction and their overall connection to the university. EU Connect will allow students to readily access up-to-date information (i.e. campus activities calendars, etc.) EU Connect will allow students, faculty, staff and alumni to connect with each other socially through EU Connect-Chat and other interactive programs. EU Connects organizational structure allows university departments to collaborate. EU Connect will be a fun opportunity for students to personalize their EU Connect experience leading to autonomy and self-satisfaction. EU Connect provides the support that is necessary for students to face the challenges that they experience in college. Practical tools like budgeting and degree audits will help students develop competencies as they steer themselves through college life. 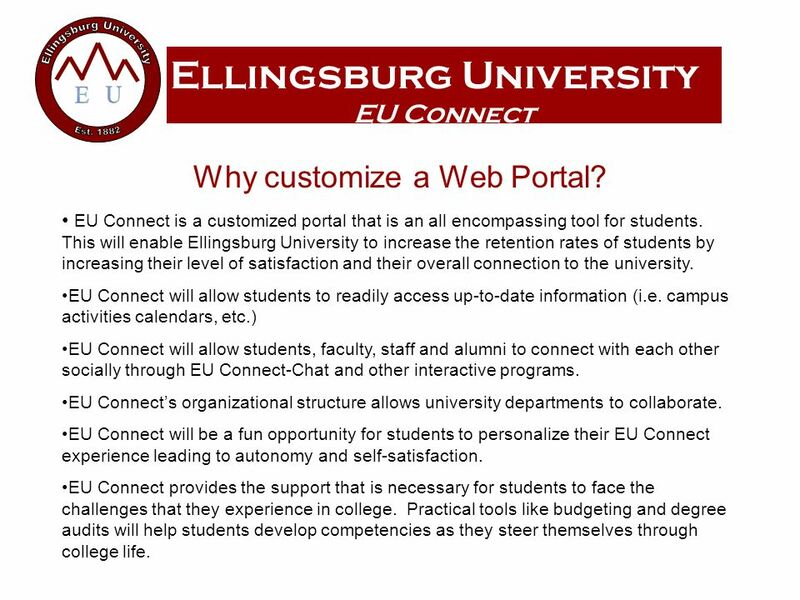 5 Ellingsburg University EU Connect The mission statement of the web portal is a part of a general web presence at Ellingsburg University which provides a customized and personalized web experience that will operate as both a resource and a tool for our students, staff, and faculty. 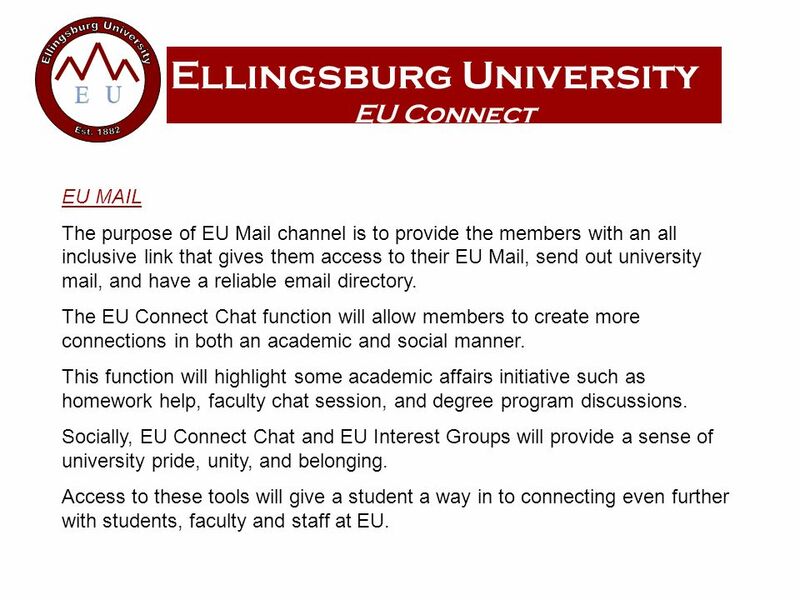 7 Ellingsburg University EU Connect EU MAIL The purpose of EU Mail channel is to provide the members with an all inclusive link that gives them access to their EU Mail, send out university mail, and have a reliable email directory. The EU Connect Chat function will allow members to create more connections in both an academic and social manner. This function will highlight some academic affairs initiative such as homework help, faculty chat session, and degree program discussions. Socially, EU Connect Chat and EU Interest Groups will provide a sense of university pride, unity, and belonging. Access to these tools will give a student a way in to connecting even further with students, faculty and staff at EU. 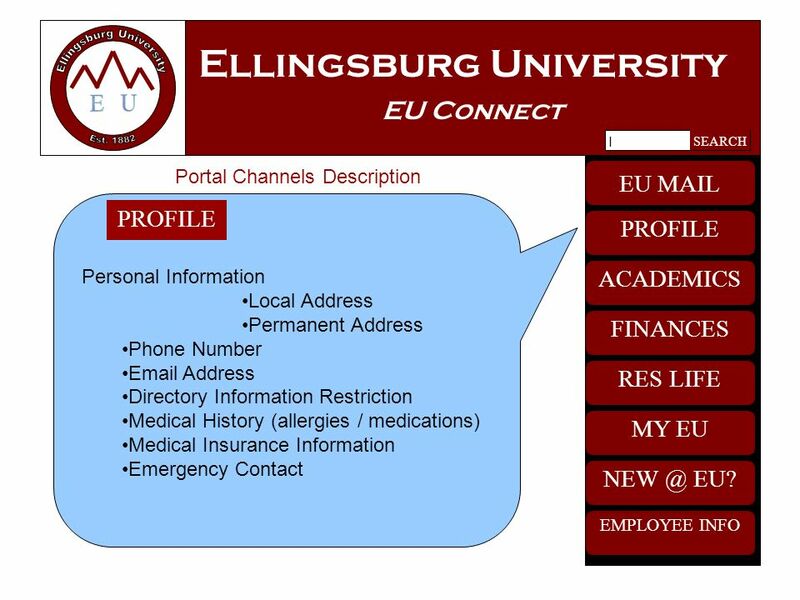 8 Ellingsburg University EU Connect PROFILE The profile section allows for the individualization of EU Connect. It is here where students, faculty and staff will provide their personalized information. This section is what will keep the university updated with members current records. According to members demographics, EU Connect will automatically customize their experience by linking them with applicable information. For example, if a student is in the College of Education, they will automatically receive the news from the college, education related societies and organizations. The members can also maintain control over their settings by subscription. 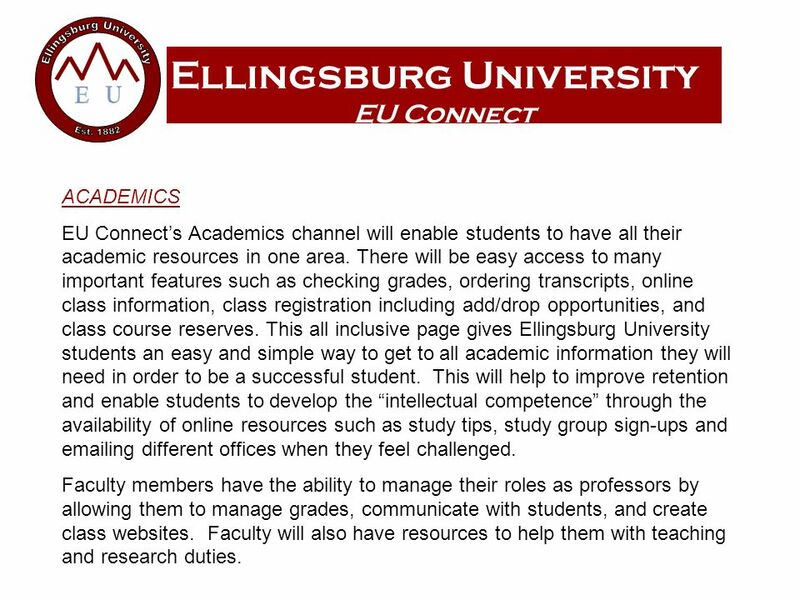 9 Ellingsburg University EU Connect ACADEMICS EU Connects Academics channel will enable students to have all their academic resources in one area. There will be easy access to many important features such as checking grades, ordering transcripts, online class information, class registration including add/drop opportunities, and class course reserves. 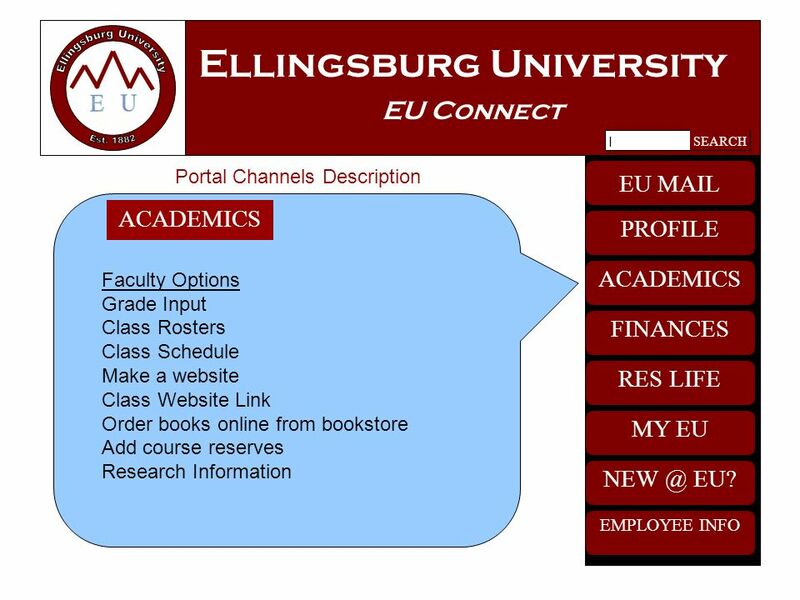 This all inclusive page gives Ellingsburg University students an easy and simple way to get to all academic information they will need in order to be a successful student. This will help to improve retention and enable students to develop the intellectual competence through the availability of online resources such as study tips, study group sign-ups and emailing different offices when they feel challenged. Faculty members have the ability to manage their roles as professors by allowing them to manage grades, communicate with students, and create class websites. Faculty will also have resources to help them with teaching and research duties. 10 Ellingsburg University EU Connect FINANCES This channel is used to help university members manage their finances through the interactive tools. This tool does not only help manage financial aid but also helps to manage budgeting. Finances also include the ability to manage employee financial records. Staff members can also handle departmental finances through this channel. 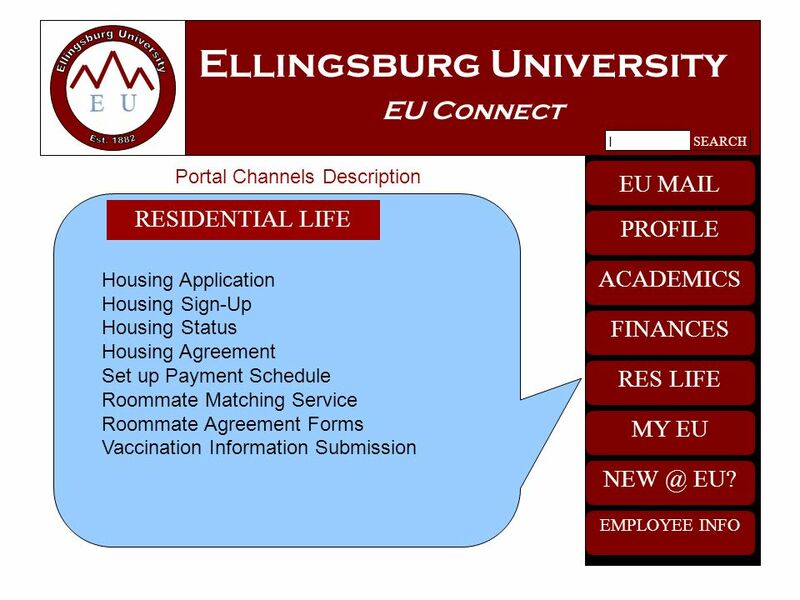 11 Ellingsburg University EU Connect Res Life This channel will be one of the most important channels due to the residential nature of Ellingsburg University. Students and staff will have the ability to manage the operational side of housing such as sign-up and agreements. University members will be able to access the food service weekly menu. Students will also have the ability to provide an online residential community through the interactive services. 12 Ellingsburg University EU Connect MY EU The MY EU channel displays the customized campus life aspect. The channel provides a university wide place for all departments to showcase their events and information. This is the main channel for university members to access information to campus resources. 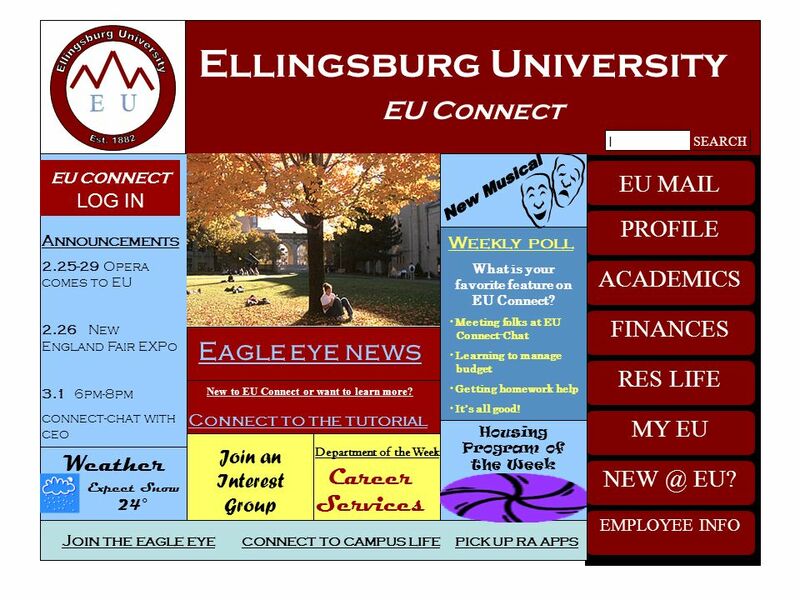 13 Ellingsburg University EU Connect NEW @ EU This is the primary channel for perspective and new students to transition to university life by providing enrollment services. This channel also has EU Connect Chat for prospective and new students to chat with current student. There are also virtual tours and information that helps university members adjust to the college. 14 Ellingsburg University EU Connect Employee Info This channel provides information for current university employees such as news and professional development opportunities. Job postings are also available for those seeking employment. 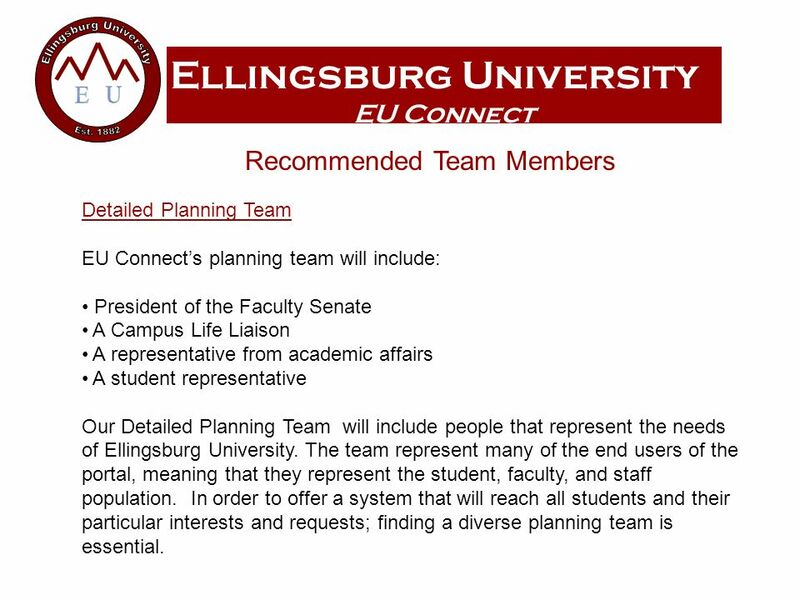 15 Ellingsburg University EU Connect Recommended Team Members Detailed Planning Team EU Connects planning team will include: President of the Faculty Senate A Campus Life Liaison A representative from academic affairs A student representative Our Detailed Planning Team will include people that represent the needs of Ellingsburg University. The team represent many of the end users of the portal, meaning that they represent the student, faculty, and staff population. In order to offer a system that will reach all students and their particular interests and requests; finding a diverse planning team is essential. 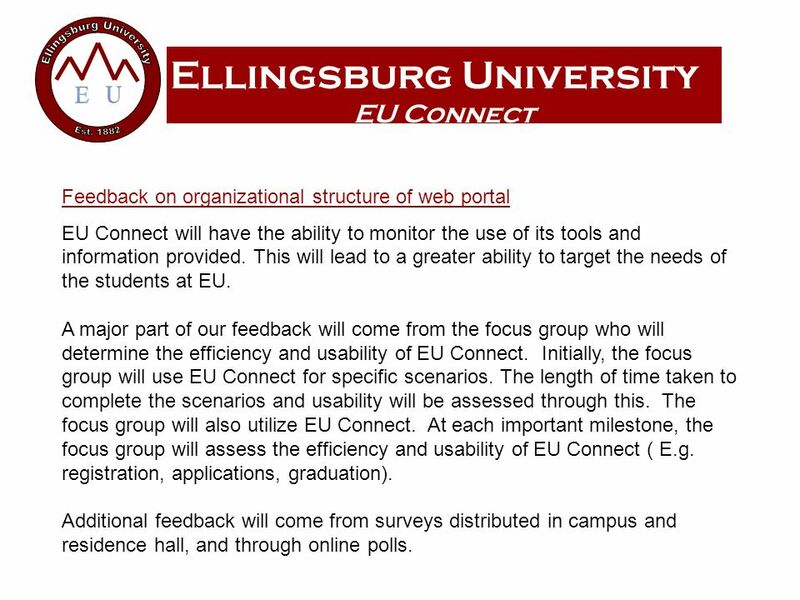 18 Ellingsburg University EU Connect Feedback on organizational structure of web portal EU Connect will have the ability to monitor the use of its tools and information provided. This will lead to a greater ability to target the needs of the students at EU. A major part of our feedback will come from the focus group who will determine the efficiency and usability of EU Connect. Initially, the focus group will use EU Connect for specific scenarios. The length of time taken to complete the scenarios and usability will be assessed through this. The focus group will also utilize EU Connect. At each important milestone, the focus group will assess the efficiency and usability of EU Connect ( E.g. registration, applications, graduation). Additional feedback will come from surveys distributed in campus and residence hall, and through online polls. 20 EU MAIL PROFILE ACADEMICS FINANCES RES LIFE MY EU EMPLOYEE INFO NEW @ EU? 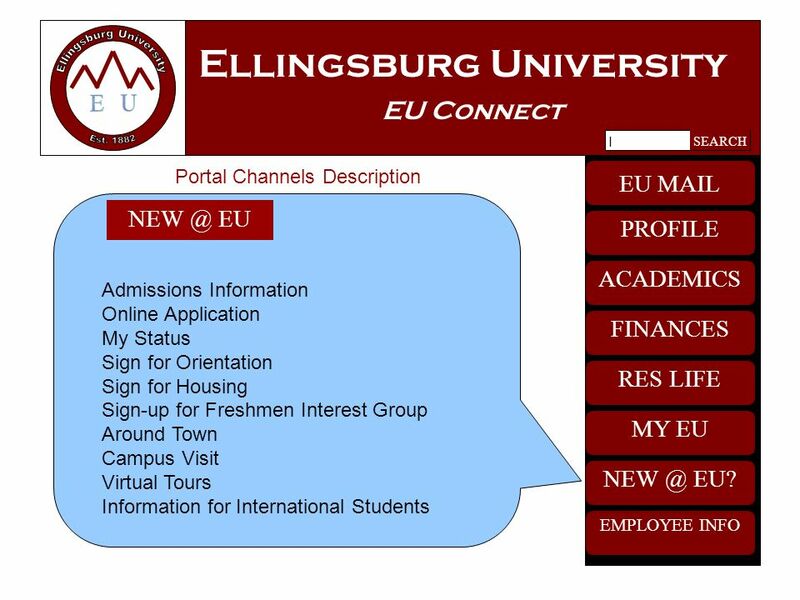 Ellingsburg University EU Connect I SEARCH This section of the presentation will now cover the portal channels and will highlight the information that can be found within them. 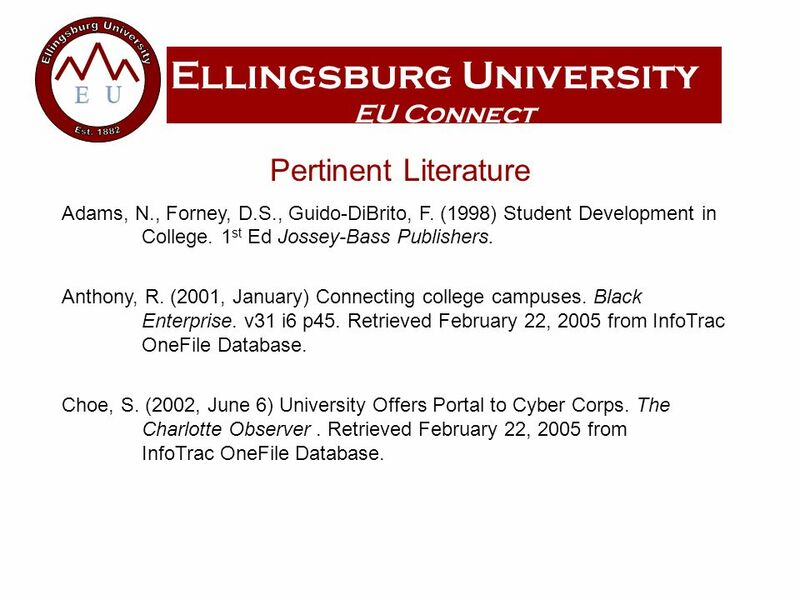 35 Ellingsburg University EU Connect Pertinent Literature Adams, N., Forney, D.S., Guido-DiBrito, F. (1998) Student Development in College. 1 st Ed Jossey-Bass Publishers. Anthony, R. (2001, January) Connecting college campuses. Black Enterprise. v31 i6 p45. Retrieved February 22, 2005 from InfoTrac OneFile Database. Choe, S. (2002, June 6) University Offers Portal to Cyber Corps. The Charlotte Observer. Retrieved February 22, 2005 from InfoTrac OneFile Database. 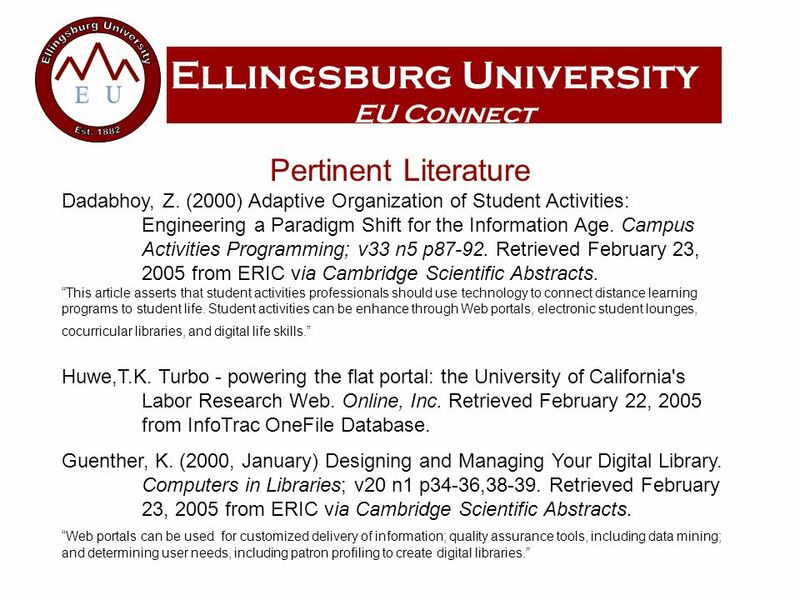 36 Ellingsburg University EU Connect Pertinent Literature Dadabhoy, Z. (2000) Adaptive Organization of Student Activities: Engineering a Paradigm Shift for the Information Age. Campus Activities Programming; v33 n5 p87-92. Retrieved February 23, 2005 from ERIC via Cambridge Scientific Abstracts. This article asserts that student activities professionals should use technology to connect distance learning programs to student life. Student activities can be enhance through Web portals, electronic student lounges, cocurricular libraries, and digital life skills. Huwe,T.K. Turbo - powering the flat portal: the University of California's Labor Research Web. Online, Inc. Retrieved February 22, 2005 from InfoTrac OneFile Database. Guenther, K. (2000, January) Designing and Managing Your Digital Library. Computers in Libraries; v20 n1 p34-36,38-39. Retrieved February 23, 2005 from ERIC via Cambridge Scientific Abstracts. Web portals can be used for customized delivery of information; quality assurance tools, including data mining; and determining user needs, including patron profiling to create digital libraries. 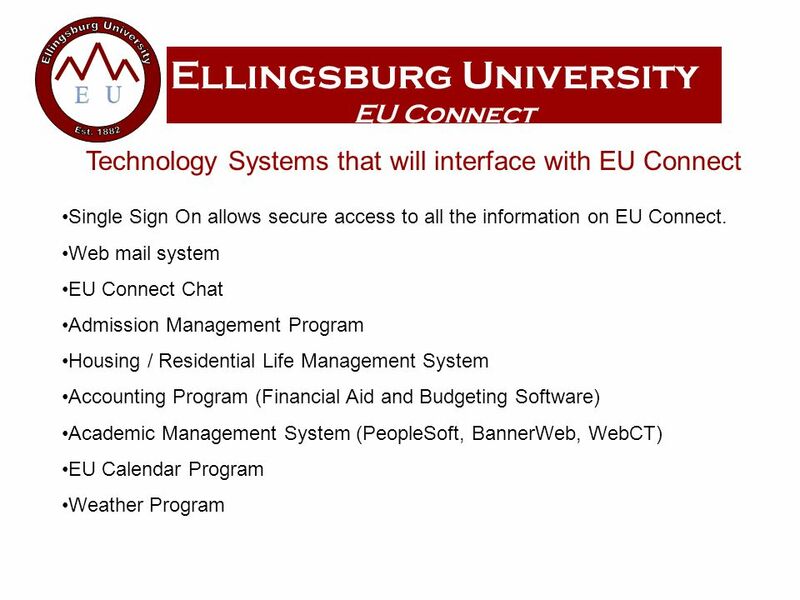 38 Ellingsburg University EU Connect We would like to thank the following: StudentAffairs.com and Stuart Brown for this opportunity to expand our knowledge of the virtual world of student affairs. Our Faculty Advisor – Dr. C. Akens. FIU Group 2 – that became a great motivator and a fun adversary. 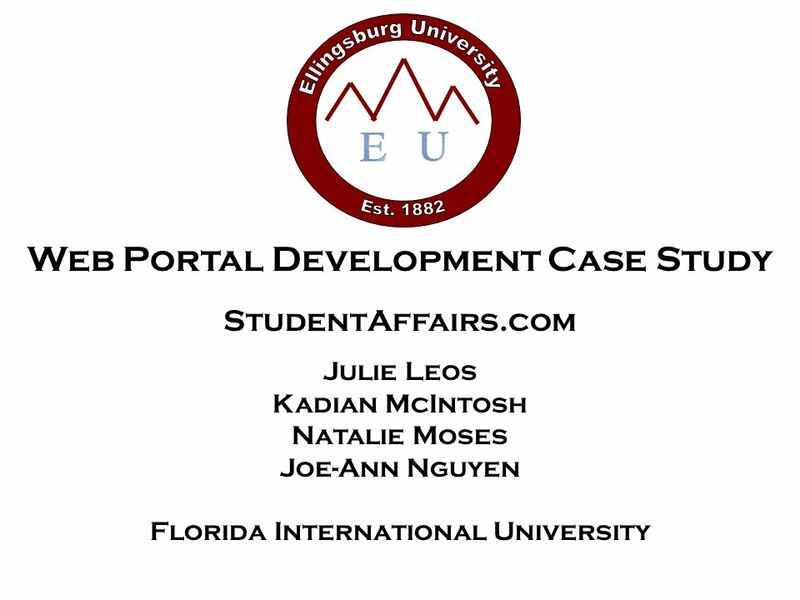 Download ppt "Web Portal Development Case Study StudentAffairs.com Julie Leos Kadian McIntosh Natalie Moses Joe-Ann Nguyen Florida International University." 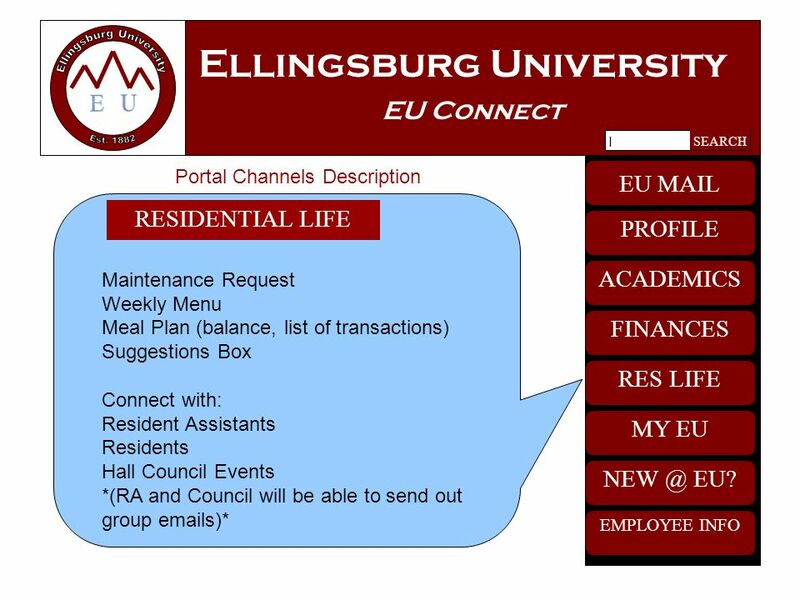 MyEU: A Customized Portal Implementation Proposal MyEU promotes interconnectedness within the campus community and will be a reflection of institutional. Forging into a New Frontier: Frontier Net and Pioneer Portals Christina Darpino Mike Gilmer Leticia Romo. Centre for the Enhancement of Learning and Teaching Communications on the iNET Douglas Anderson Aberdeen Business School iNET Team. When will the helicopters end? Giving Parents Access Case Study The University of Arkansas and Southern Methodist University M3.3 February 4, 2013. Getting to Know Your Campus The COA Web Page Resources to help you be successful. ISIS Upgrade Project ISIS Faculty Self Service Your Sneak Peek Faculty Senate, November 2, 2009. Manager Self Service August 2010 InSITE Self Service Manager Self Service Presentation This presentation is approximately 10 minutes in length. This. PirateNET Park Universitys Portal. PirateNET Park Universitys Portal Park University, a private institution based in Parkville, Missouri, enrolls 1,500. Everything you wanted to know, but were afraid to ask……..
Atlas A Student’s Perspective Goals A look at the new Atlas Changes and added features A better understanding of Atlas A student’s point of view. Introducing the new MyGCU Portal Click your mouse button to begin. An Overview. BizLink BizLink is a Social Networking platform for business. It allows colleagues to come together, ask questions, share resources, form. WICHE (Western Interstate Commission for Higher Education) WCET – Western Cooperative for Educational Telecommunications – A national leader in helping.